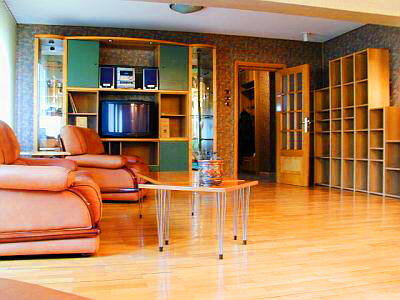 With EastConfort you can find cheap Bucharest apartments, that will suit every need and desire. All the Apartments in Bucharest, Romania are shownd below, ordered by popularity, price or the number of guests. An elegant cheap Bucharest apartment, unique in its kind, comfortable but above all beautiful, can accomodate 3 couples. The flat is made originally of 2 apartments, newly refurbished, covering a total 150 sm area, properly fitting office activity or business meetings. It consists of one large saloon, pleasantly furnished with leather sofas and armchairs, full sized bookcases and the wooden-laminate floor, the air-conditioning and high-tech endowments offers comfort. The three bedrooms are well-furnished with queen sized beds and the detached kitchen is fully equipped for self-caterings (large fridge, ustensils), while the two large bathrooms are accesorized with: bathtub, shower and washing machine. There are 2 parking places with automatic access system. A must see our Romanian apartments in Bucharest! Well-appointed downtown, in a nice area, it is close to major businesses and government offices from Bucharest, next to the famous Palace of Parliament and the Marriott Hotel. You might go to Beer Garden (from May to October), Champions Bar & Restaurant (American) open for lunch/dinner, Cuccina (Italian) open for lunch/dinner, Cupola (International) open for breakfast/lunch or Vienna Cafe (Coffee House) open for lunch/dinner.